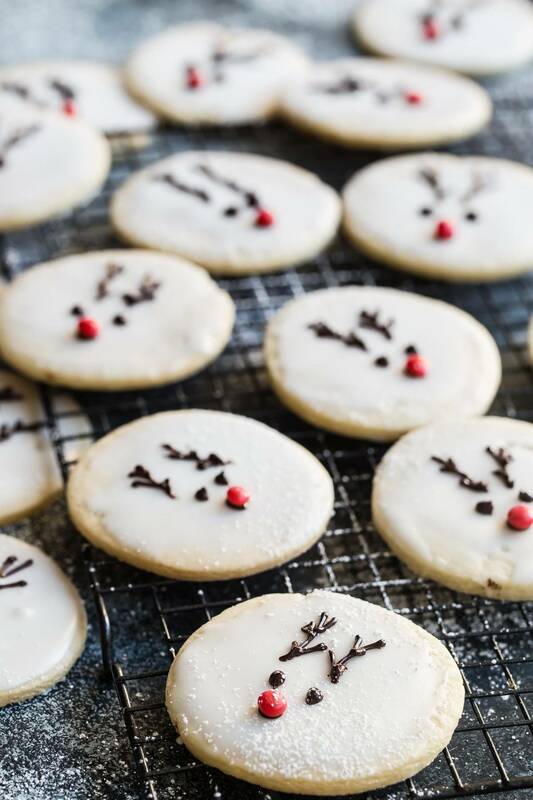 Everyone needs these cute reindeer cookies at Christmas time. These are easy to make and fun for kids to help. Christmas is such an awesome time for so many reasons, and one of those reasons is cookies! 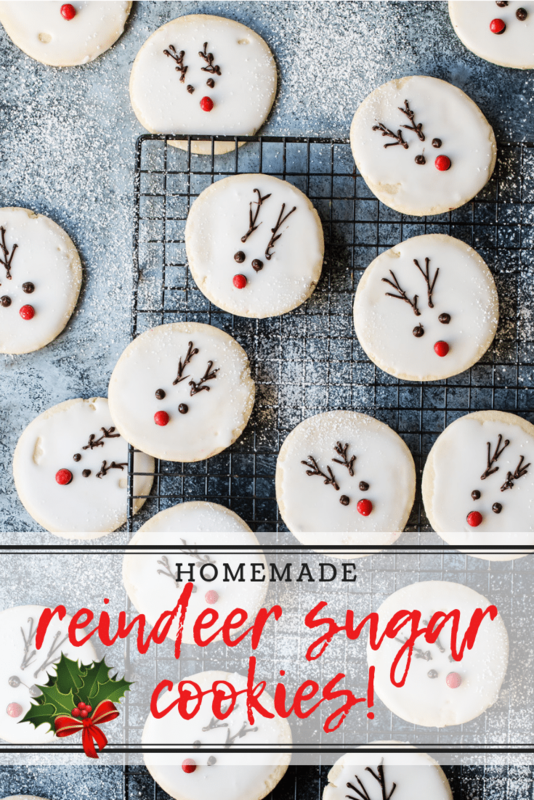 It’s all about the cookies right now and I spotted some really cute reindeer cookies at Starbucks recently and knew I should be making these. 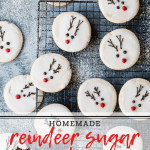 Reindeer cookies aren’t new but I’m glad to add them to the blog. And the fact that they’re so simple to make is proof everyone should be making them. Making sugar cookie dough for reindeer cookies. 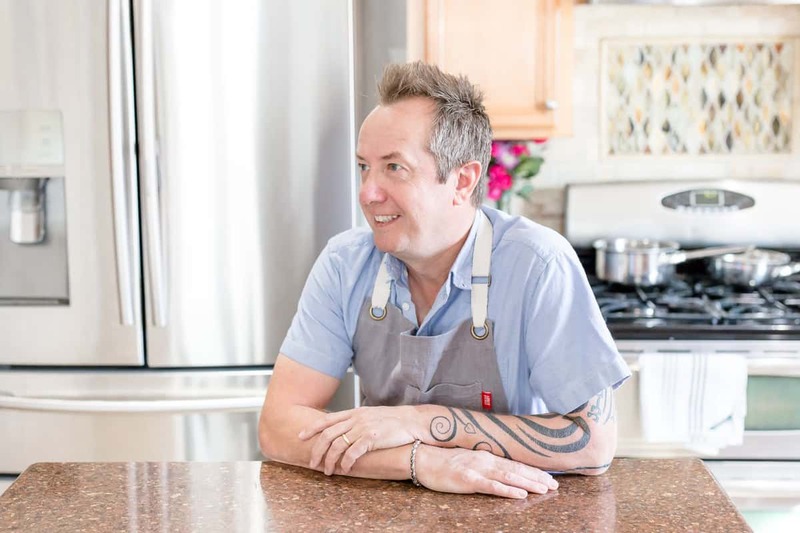 The base recipe is just a simple sugar cookie. I used this one from last year when I made my double chocolate peppermint cookies. Once you’ve made your cookie dough, the most important next step is to let it rest in the fridge for at least 30 minutes. I know this can be hard to do because the fun part is rolling out the cookies and cutting them into shapes but let that dough rest. By letting the dough rest, the butter or fat becomes solidified again. If you went ahead and made the cookies right after mixing, the dough would be sticky, soft and probably run a little in the oven ending up flat and thin. I like my sugar cookies to be about a quarter inch thick. You don’t want something so thin that’s going to break when you come to frost them with icing. These cookies won’t spread on your baking sheet either so go ahead and place them fairly close to one another. How to decorate your reindeer cookies. A simple powdered sugar icing is all that’s needed. You’ll see the quantities on the recipe card below but be careful when you go to mix it together. Powdered sugar icing can be finicky and a drop too much liquid and you could end up with a runny mess. If you do add too much liquid, just add more powdered sugar until you get it back to a stiffer consistency. I also find that warming the icing helps it to set, so a quick 15-20 seconds in the microwave is helpful. 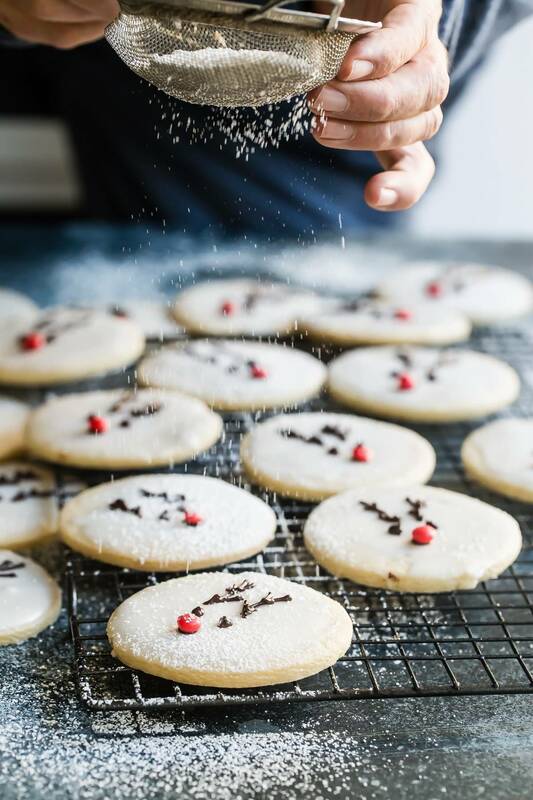 Once your cookies are cool and you can handle them, dip them into the icing and carefully wipe your finger or a thin spatula over the whole surface to take off the excess icing. Too much icing is not a good thing. Finally using your finger, run it around the perimeter of the cookie to prevent any icing run-off. The cookies should set in 5-10 minutes and be ready for the final steps in decorating. Making the faces for reindeer cookies. 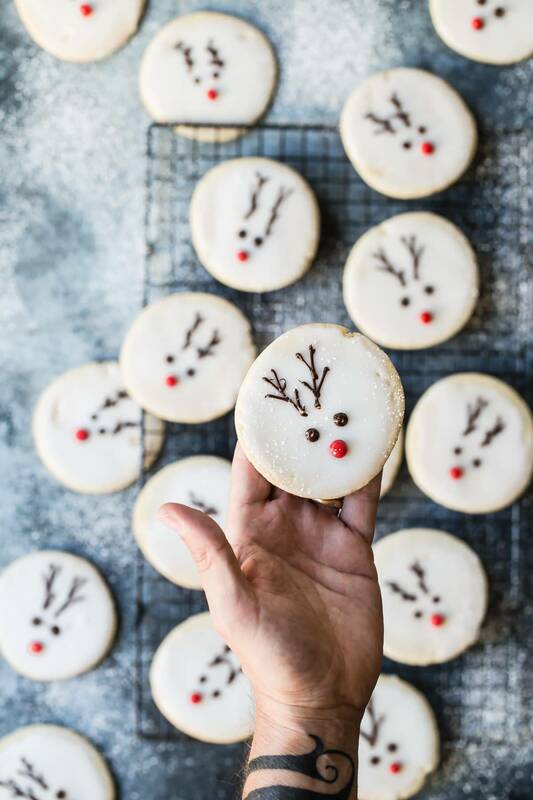 This is my most favorite part and probably the kids part too because we get to stick that bright red reindeer nose on the cookie and finally it looks like the cutest cookie you’ve seen all year! bag with a tiny hole cut in the corner you can draw the antlers on the cookie. Start with two lines and then on each side of each line, make a couple of small V shapes to imitate the smaller parts of the antlers. Pipe two chocolate circles for the eyes or you can buy googly eyes made from sugar, and a small chocolate circle for the nose. That’s where you’ll stick the red candy. That’s it, you did it! 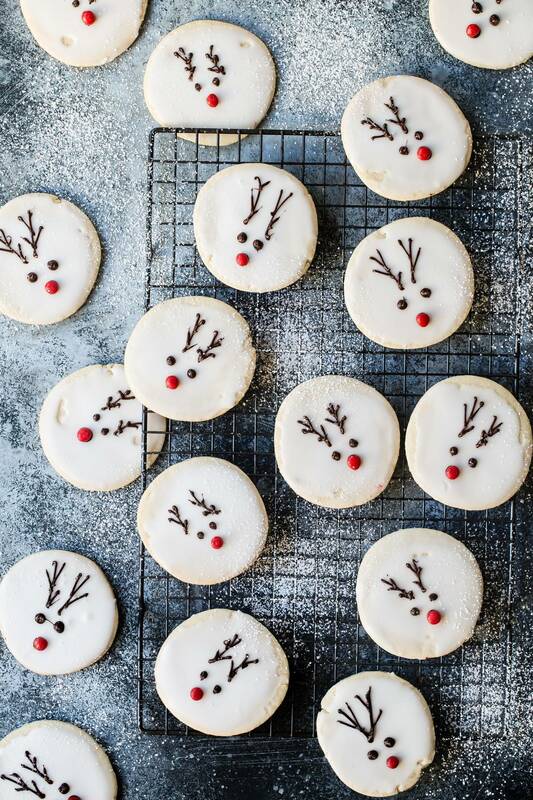 You just made the cutest Christmas cookies in the neighborhood. Leave me a comment if you have any fun traditions at the holidays that involve cookies. I’ll be posting many more so make sure you’re following along on Instagram, Pinterest, and Facebook to see the latest! Some kitchen tools I recommend to make these cookies! 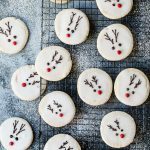 These reindeer cookies are so cute and are sure to be a hit with the kids! Make them for school Christmas parties or leave some out for Santa on Christmas Eve! In a bowl combine the flour and the baking powder. Preheat the oven to 350 degrees F. Line a baking tray with parchment paper. Using a stand mixer cream the butter and sugar until well mixed. Add the vanilla and eggs and combine, making sure to scrape down the sides of the bowl periodically. Add the flour gradually until the dough forms and clumps together. Transfer the dough to your table and pat it into a ball. Wrap the dough in plastic wrap and let it rest in the fridge for 30 minutes. Afterward cut the dough in half and roll out each half until about 1/4 inch thick. Use flour to prevent the dough sticking to the table. Cut out circles using a 3 inch round cookie cutter and place them on the prepared baking tray. You may have to do this in two batches. Bake in the oven for 14 minutes and let cool. Repeat with any leftover dough. Once the cookies have cooled make the icing by mixing the powdered sugar and milk in a microwave-safe bowl. Mix until all lumps have disappeared. Place the bowl in the microwave and heat for about 15 seconds, stir again. Dip the cookies into the icing and wipe off the excess with a knife or your finger. Melt the chocolate while the icing sets. Once the icing has set use the melted chocolate to pipe the antlers and eyes on each cookie including a spot to stick the red nose onto. Well, aren’t these the cutest! So cute! Love these. Gorgeous photos too. It’s all about the cookies indeed! These guys are too cute!